Even though my new book is called “Under the Influence – How to Fake Your Way into Getting Rich on Instagram: Influencer Fraud, Selfies, Anxiety, Ego, and Mass Delusional Behavior” it’s not just those engaged with fraudulent behavior that portray an idealized life. It makes sense that those that fake their followings, comments, and likes would, of course, take photos that make them have a perfect life because of a purse, an outfit, a vacation, or a myriad of other materialistic things. Obviously, they want you to think that having more stuff or more glamourous vacations makes them a better person, and you too can be a better person if you just get these products and services they mention. Most of that is out of reach for people, so it naturally depresses them and causes anxiety. To me, this is a second crime against the public, as not only are they portraying a nearly impossible lifestyle, but they faked their numbers to get these products and opportunities. The public thinks it’s all real, and it causes undue anguish on a pandemic level. So, let’s stop talking about those sorts of people for a moment (the ones committing fraudulent activity), and instead talk about all the other people out there who portray a perfect lifestyle. No doubt many of them are emulating those above, but there’s a huge Venn diagram overlap with basic ego tied any or all of the following: body image, materialism (bags or cars), special events, vacations, and this sort of thing. I’m not saying that every one of those posts is ego fuelled. For example, sometimes people just like to show off a new outfit without conceit. But, the more harmful ones are the type where they are either subtly (via a humble-brag) or overtly illustrating that their lives are incredible and they really want you to know about it. Because, in their twisted logic, only if you KNOW about it, then it must be true. Some of these are paid posts from sponsors, where people may get paid a few thousand dollars to talk about anything from a teeth whitening product to a special sort of tea. They usually have special directives from marketing to explain a few talking points about their product. They are puppets telling you that if you had XXXX, your life would be better. This kind of Influencer marketing is especially insidious because it sounds so authentic coming from a person you think you know. We all see ads on TV that tell you your life would be better with a certain car or your babies would be happier with a certain diaper. But we have grown numb to most of those as that’s what we expect with commercials. But when you hear about something from TV personality you respect, it has a different effect on your mind. It’s almost as good as a recommendation from a friend. I believe the vast majority of “showing off” posts are not paid posts, but instead, people emulating the paid posts (of both authentic and inauthentic Influencers). As we all know and lament, there is a dirge of originality in the world, which means at least 90% of human behavior is merely a copy. I’m being generous and saying 10% of the 8 billion people on Earth create something entirely new that is interesting enough to be copied. Everything else is either a copy or an obvious derivation. Remember too that it may not be the photo so much as the description that they copy to try to induce engagement. They may ask, “What is your favorite dessert?” or “If you could be in a jacuzzi in any country in the world, which one would it be?” or “What is your guilty pleasure?” Keep in mind this is a method they copy from other Influencers to get you to respond. The important thing to remember is: they don’t care about your actual response; they only care about a lot of comments. Because some of the most-followed accounts are the ones that get the paid endorsements, less-followed accounts that aspire to that lifestyle end up copying the style, mood, and contents of their photos. And this is why your feed is full of such vapid, relatively uninspired content. But when you see dozens or hundreds of posts of people living the perfect life (90% of which are copies of paid posts), it will end up having an effect on your psyche. Again, if you’re having an awesome experience or you feel great about the way you look today, there’s absolutely nothing wrong with sharing it online, as long as you’re not subtly or overtly making yourself sound superior to your followers. How to get around this anxiety? Well, I talk a lot about this in the book. In fact, the whole second half of the book is dedicated to this topic of self-preservation in the online world. I could have called the book “How to Stay Zen on the Internet,” but I like the more clickbaity title. Besides the ideas in the book, here are some additional suggestions. If you notice one Influencer in particular that you follow causes you to continually feel bad about your life, just unfollow them. There have been studies that show people rarely unfollow after they choose to follow, but you can be the exception to this rule. It’s fun to cull! Another idea is to seek out accounts that make truly original, funny, or interesting content that inspires you and improves your mind or your life. Consider this is your friendly weekly reminder that you shouldn’t believe everything you see on Instagram, especially if it feels too good to be true. 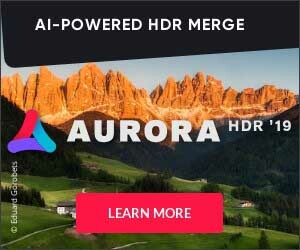 Real Instagram handles and names are used throughout as examples. I provide my personal opinion on what may constitute fraudulent behavior on social media, based on the evidence and data available to me. The reader is welcome to draw their own conclusions. Now, this may have NO interest to you at all… because it’s not even about photography… it’s about the creation process of a book. My new book, actually… so, today, for you Passport members, you get to see my towards the end-cycle of a random creative endeavor! And now for something COMPLETELY different. I’m always trying new things… I think this is very important to keep the brain plastic and always learning. I’ve never written a book of this nature before, so here is some of the behind-the-scenes stuff of the things I was working through with the book. Enjoy! I have a new book! Come grab it now exclusively on Amazon! I almost called the book “How to Stay Zen on Social Media,” because that’s one of the main points! 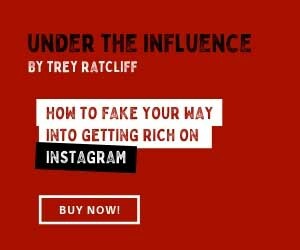 However, I decided to go with the more click-baity name of “Under the Influence – How to Fake Your Way Into Getting Rich on Instagram: Influencer fraud, Selfies, Anxiety, Ego, and Mass Delusional Behavior” … Catchy eh? I see quite a bit of suffering out there on social media, and that’s why I wrote this book. I hope it is a fun way to open the door, if even just a little, to have people become more mindful in their daily activities. Social Media, if used wrongly, can really add to a lot of undue suffering. Another source of suffering is some of these Instagram Influencer charlatans are using completely unscrupulous tricks to gain a big following and engagement to trick brands into giving them the seemingly ideal lifestyle that is perfectly Instagrammable. So, a lot of people suffer anxiety when they see this stuff online because they feel like losers. But that is all based on a lie, so there is zero need for you to have any internal suffering by comparing yourself to a crook. I’ve accidentally become an expert in all these subject matters just because of the way I live my life. 90% of my income here at my company comes from fine art sales. A minority is from Influencer gigs and that is where I discovered this unfortunate underbelly of the Instagram world. I’m not writing this book because I feel like these people are taking anything away from me. They’re not. These fraudsters have created what I call Mass Delusional Behavior. I get into that in the sections about selfies and the ego. You’ll find the book to be quite philosophical in an approachable way. You’ll see some of the traps a regular person can fall into that can lead to an empty life where you only feed the ego instead of becoming your true self. It shows there’s another path!